For about a year and a half, Jonathan Hickman has been writing one hell of a Fantastic Four. As I stated in a previous article, Hickman has been able to build on tonal shift that Mark Millar implemented on the book previously, and has made this the best run on the title since Mark Waid wrote it back in ’03 and ’04. With the “Three” arc the writer has been able to pay off several ideas that he has set up since starting on the title. 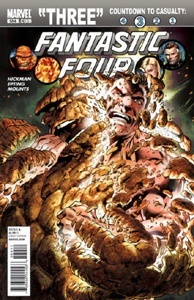 Of course, the big news is the death of Johnny Storm, the Human Torch. The Torch has never been my favorite member of the group, but he is a major part of the greater pantheon of Marvel Superheroes. There’s also the ever-present notion that this death, like all other comic book deaths, is temporary. I don’t really mind, as long as we get some good stories before his inevitable resurrection. Death isn’t anything new to the Fantastic Four. Reed Richards (Mr. Fantastic) was killed off in the mid ‘90s and returned after a while. Ben Grimm (the Thing) died briefly during Mark Waid’s run. Even Mark Millar had a storyline titled “Death of the Invisible Woman” that ended with the demise of a Sue Storm from the future. Johnny’s number was going to get called at some point, I guess. Leading up to and during “Three”, Hickman was very skillful in make sure the conditions were appropriate for the end result. The FF has always been at their best when all four members were working together. They have the right combination of powers and personalities to meet and defeat just about any threat. This meant that Hickman needed to divide the group before taking someone out. As a result, Reed was sent across the galaxy, with Galactus no less, to wrap up a plot point that had been hanging around since Millar’s run, Nu-World. 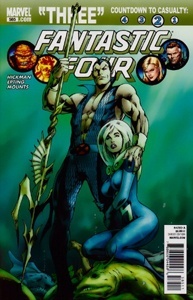 Sue continued to her ambassadorial duties, by chairing negotiations between the Lost Atlanteans (from the recent “Prime Elements” arc) and the king of the oceans, Namor, deep below the sea. Needless to say, both situations went to hell. Reed had to evacuate Nu-World before Galactus destroyed it and Sue had to prevent a war between the fish people. Even though Ben was still hanging out with Johnny, he was depowered by a formula created by the Future Foundation kids, who have been staying with the FF. In the most touching issues of Hickman’s run, #584, we got to see Ben, with the help of Johnny, make the most of his first night a normal human being (well, since the last time he was depowered). Not to be left out, Ben and Johnny had to be thrown into their own life or death situation: stopping a second Annihilation Wave from streaming out of the Negative Zone portal in the Baxter Building. Make things even more complicated, the duo needed to do so, while protecting all of the kids in the FF’s charge. Everything came to a head in Fantastic Four #587 (released a day early and sealed in a black plastic with a big blue and white “3” on it). I few weeks ago, I thought it would make for a great twist if “Three” actually meant the number of deaths, rather than survivors. Also, with the Thing popping up in various solicitations and promo ads for upcoming comics, good ol’ Ben looked to be at least one, if not the only, survivor. Early into the issue it was pretty clear that the result would be everyone but Ben, or just Johnny. Ben and Johnny were placed in the only specified “no win” situation. To close the portal to the Negative Zone, someone had to stay behind. Sue and Reed’s respective predicaments didn’t seem so dire in comparison. Since it was apparent that Ben was going to live, Johnny was certainly going to be the death of the issue. Still, the moments leading up to the Torch’s sacrifice were very emotional and highlighted the strong friendship between Johnny and Ben, made even more sad by the last minute, but too late return of Ben's powers. The Human Torch goes down fighting and we leave crying. Also worth noting that all five issues were wonderfully rendered by penciler Steve Epting. Epting finds a solid balance between photo realism and classic illustrative work. His style is very indicative of ‘70s Marvel work in the mode of John Buscema and John Romita, while still feeling very modern. Epting has been putting out consistently solid work since the early ‘90s and he’s shown no signs that he’ll won’t in the future. I also want to acknowledge the wonderful covers by the legendary Alan Davis. He’s been providing them since Hickman’s run began. While I usually prefer that the covers be drawn by whoever is providing the art for the interiors, I’ll take every opportunity I can get to look at Davis’ amazing work. 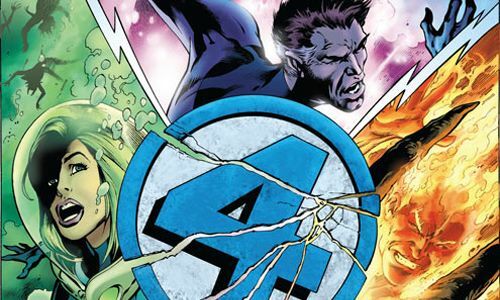 Next issue of Fantastic Four is supposed to be the last one. In the following month, Jonathan Hickman and Steve Epting will be back with a new series simple called FF. Something tells me that the twelfth issue of that series will be renumbered #600 and the series will be retitled Fantastic Four. 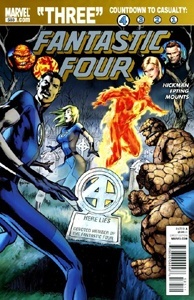 2011 is the fiftieth anniversary year for the Fantastic Four, so I seriously can’t see the team not reappearing by the end of the year.